Welcome to my stop for Blogathon Canada - Edmonton, Alberta. My internet friend Kelsey from Everyday Fray is hosting from Calgary, Alberta and you will want to check her post out too. First I get to tell you a bit about me. I have been sewing, knitting, embroidering and crocheting since I was about 5 years old, taught by my super talented Grandmother. I put off quilting for years as it is not very portable but one very rainy March break holiday in 2010 I gave in and made my first quilt with the design help of my kids. A year later I began this blog and the rest is history. I enjoy learning about all kinds of quilting techniques but over the years it has become clear to me that I most love modern quilting. I mostly design my own quilt patterns now, but not always For example, the pattern of the quilt pictured above is by my friend Krista, who blogs at Poppyprint and lives in Vancouver. I did not actually meet Krista in person in Canada, instead we had to both head over to London, England to actually meet up. We attended the Fat Quarterly Retreat - I've been twice - where I have had the pleasure of meeting many quilters from the UK who I had previously met online. I especially love the quilting part of quilting, so much so that I purchased a beautiful Millennium APQS Long Arm Quilting Machine in February 2013. I have been having the best time learning to quilt with it. 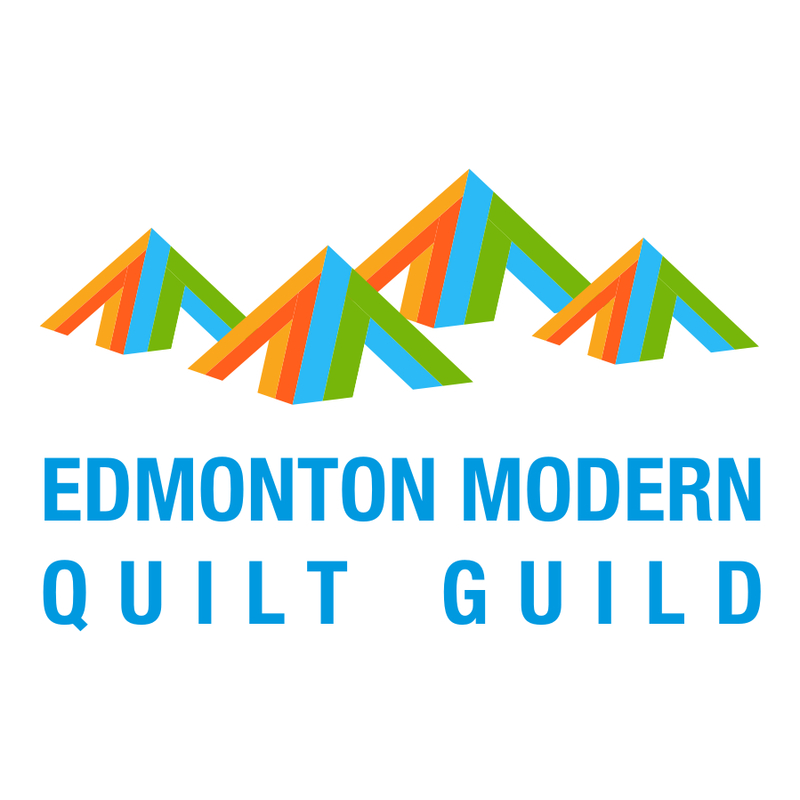 I am a member of the Edmonton Modern Quilt Guild and I attended the Modern Quilt Guild's first QuiltCon and I'll be at QuiltCon again in February next year. 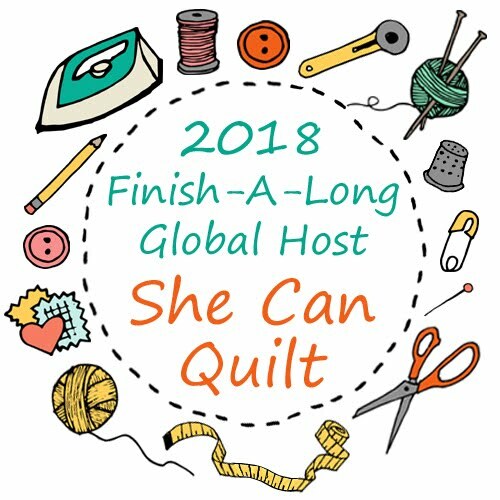 Besides QuiltCon and the Fat Quarterly Retreat, I have been able to meet quilters at Sewdown Nashville, Pittsburg Quilt Market and the Grand Rapids AQS Show. I have also entered some of my quilts in Quilt Shows and have even won some ribbons. Edited: the giveaway is now closed, thank you. Leave me one comment per person. Let me know where you live and if you have ever been to Alberta or other places in Canada. And if you blog, feel free to share the link to your blog in your comment so others can visit you too. Make sure I can find you, so if you have any doubt, put your email in your comment. If I cannot find you I will draw again. The giveaway is open until 10 pm MST November 23 and I'll make a random draw from the comments and announce the winner the next morning. Each day throughout Blogathon Canada week, Sew Sisters will be giving away prizes too. Today, the giveaway at Sew Sisters is sponsored by Northcott Fabrics - so go here and enter too, today and every day this week. 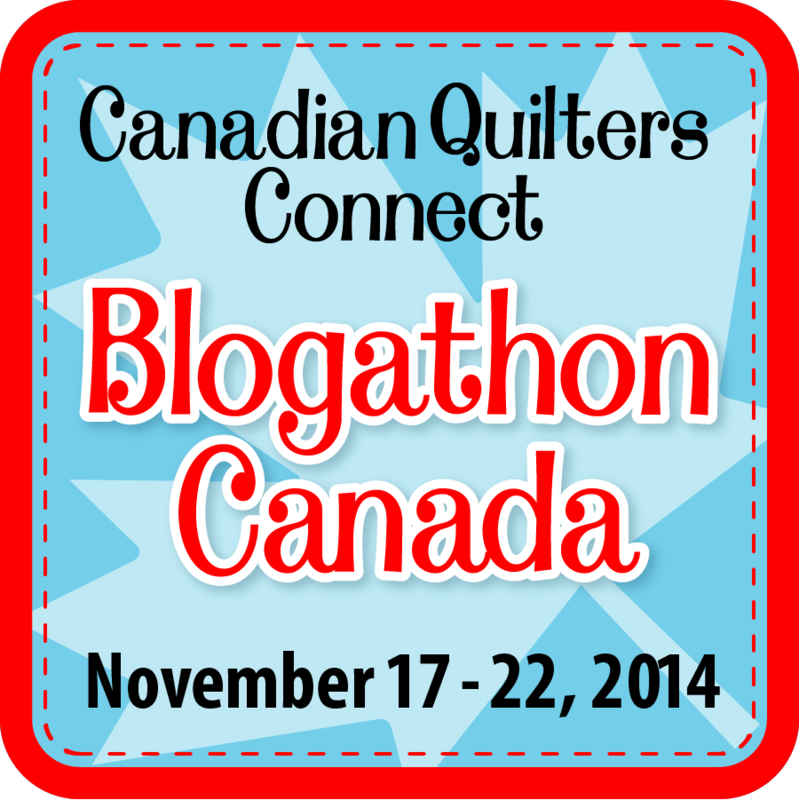 I hope you enjoy meeting all the Canadian quilt bloggers during Blogathon Canada. I am in NC. I love the quilts. The giveaway fabric is just my color, blues. I have been to Toronto and Montreal. I loved both cities but I admit I'm a wimp, 30 years of Chicago and Milwaukee and I headed South. I don't like the cold. I'm in New Zealand and have never been to Canada. It's on my bucket list though. My cousin actually married a Canadian girl many years ago and I have been promising to visit him like forever!! His tales of winter put me off though! I'm very impressed with your bold, exciting, COLORFUL quilts! Your quilting is fabulous, too. I live in Sun Lakes, AZ (just South of Phoenix). So far, I've only visited Vancouver, BC. I loved it and the people of Vancouver who were so gracious and friendly to a couple of tourists. If you're ever there, a visit to Butchart Gardens is a must! You probably know I live in Melbourne Australia, but it may be news that I visited Canada back in 1980! I went to places such as Vancouver, Calgary, Toronto and Montreal! It was April and I remember being very cold at times, but I loved it all the same! I live in Missouri, USA. I have been to Toronto twice and to Windsor twice. I loved Toronto and its museums. Toronto is like a mini UN with its ethnic diversity. I loved it. I live in Scotland. We travelled with the kids and my MIL to Vancouver, Vancouver Island and did a road trip up into the Rockies - Lake Louise, Athabasca Glacier, etc. We loved our brief glimpse of Canada so much we were tempted to emigrate! I share Kathleen D's opinion of Butchart Gardens - they are beautiful. Greetings from Cape Breton! I've never been to your little corner of the world, yet. I hope to travel out that way some day. Your work is amazing. You must spend hours machine quilting those beautiful pieces!! 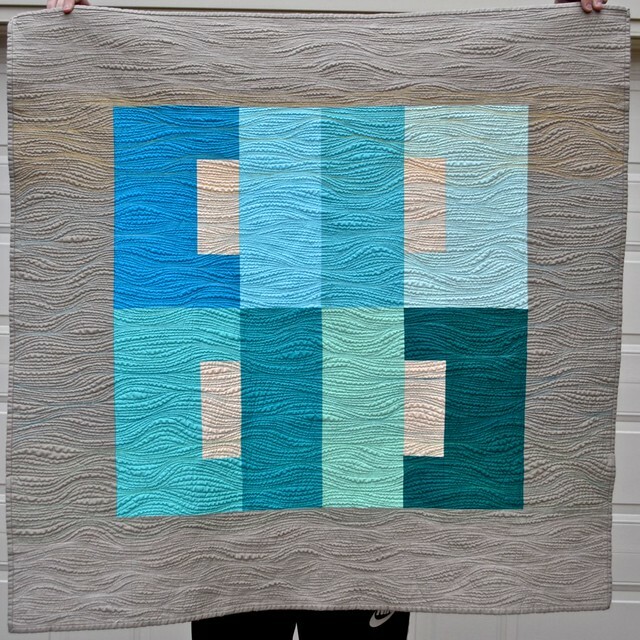 Love the FMQ on your gray with blues quilt! It is just beautiful :) I currently live in Yarmouth, Nova Scotia. I've lived in Cape Breton and Halifax. I lived in Edmonton, AB for a year and I did like it there. Met lots of great people who I keep in contact with. I came back home because I missed family and the ocean. Thanks for a chance at a great prize! Love that bundle! I live in Indonesia and I have never been to Canada, but I would love to! I love your pillows! You mix colors beautifully. Good morning. I am from Nova Scotia and have visited many areas in Alberta . I lived in Edmonton for a while while attending U of Alberta there. Lovely provience. Just lovely Leanne!! I soooooo enjoy seeing what you quilt on a project. I love this latest one.,..the one involved...it looks fantastic!! Wow, sew many ideas and suggestions with the blog a thon. Thanks for sharing your lovely quilts. I live in North Carolina, USA. I'm an Army brat & we were stationed in Alaska in the early 60s. We flew up there but my Dad decided to drive back to the States, so we took the ALCAN highway & drove down through Canada. I remember visiting Lake Louise. Thanks for the chance to win. I loe your modern quilts and quilting! I live in southern Finland, have never been in Canada, not even on the continent :) The closest I've come is reading Lucy M. Montgomery's book series of Anne of Greengables that is locaten on Price Edward's Island if I remember correctly. I do live in Alberta - in Calgary - and have been here for about 7 years. (I think Saskatchewan is still home though; I still feel like a tourist here.) I blog infrequently at Work-in-Progress Girl. Hi there! I am originally from Quebec but I have called Nova Scotia home for almost 20 years. Technically, I have been to Alberta... that is if you count a stopover at the Calgary airport on one of my two trips to BC. I blog at www.runningthimble.blogspot.ca. I love your quilts, and especially the quilting. Just stunning! Especially the last one pictured on this post. Wow. I live in Ontario, 1 hour 30 mins from Toronto, and yes I have been to Calgary and Edmonton, loved both places, your quilting is beautiful,and that doe collection is to die for, just love those colors, there yummy! Hello from Fredericton NB! I've been to Alberta a few times including this past summer! Love all your quilts! I love reading your blog and seeing your gorgeous work! I live in Kentucky and have visited Canada several times, but not Alberta. Hi Leanne, Colleen here. I grew up in Edmonton then moved to Ontario to attend art college, back to Alberta but Calgary that time then finally to Saskatchewan. I have traveled all over this wonderful country of ours except to the far north. I hope to visit my brother-in-law there someday. I would love to win me some Doe ! Wow! You do such fabulous work! I live in Cape Breton, Nova Scotia, but my daughter lives in Calgary, so I do get out there occasionally! I have a blog called The Cuddle Quilter and am participating in the hop, meeting lots of new blogging friends. Thanks for the chance to win that gorgeous fabric! Yes, to Alberta and most of your provinces! I spent my first 21 summers in Kingsville, Ont. I do hope your visit to Grand Rapids was pleasant, my hometown. Modern quilters in GR are establishing a modern guild for which I write the blog: GRMQG.blogspot.com. I love the fabrics shown, so spring like- we just were blessed with 18" of snow in 36 hours, not quite Buffalo, but enough to make great seeing days. Your creations are gorgeous!! I live in a small community north of Lake Superior (Ontario). We travelled out west several years ago on a summer holiday to visit Banff, Jasper, etc etc. I had never seen mountains before so it was amazing!! I want to go back. Hello from the USA. I've only travelled to Ontario but would like to see more of Canada-Nova Scotia and the Alberta are on my list! Hopefully I get there! Thanks for the giveaway-blues are my favorite! I'm in Wyoming in the US. I've been to BC a few times once on the only "real" vacation my family took when I was a kid. We had a blast. The other time I was visiting my aunt. I've known some really great people from Alberta, but I've never visited. Used to live in Alberta, still miss it! Love your quilts. I live in Ontario and yes I have been to Alberta. What a beautiful area. Hi I live in Montreal, but lived in Edmonton for two years in 1996 and for two years as a child I lived in Calgary!! Great cities to live in! Thanks Leanne for the wonderful introduction. 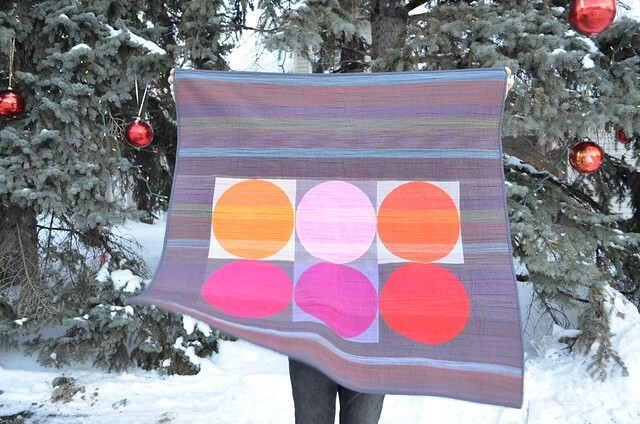 Looking forward to visiting with Alberta's quilt bloggers today! I'm in the Rockies on the BC side but hail from Edmonton area originally. I purchased an APQS Millie from Sparrow Studioz 6 months ago and I'm loving it. I'm new to your blog and like your aesthetic; gonna spend some time browsing. Thanks for the giveaway! I would love to win your fabric bundle. Great colours!! I'm an Alberta blogger too. I'm in Saskatoon, about a 5 hour drive east of you. I love your work. So nice to get to know Canadian quilters. Woo hoo, a Doe bundle -- I would love this! I live in Ontario, but I've visited BC, AB, Quebec, New Brunswick, PEI and Nova Scotia. I consider myself very lucky:) Great blogathon idea too! Ohio, but I'm from California! I've a;ways wanted to visit Canada! Southern Ontario is now home but I have skied in Banff and visited Calgary. Would love those gorgeous fabrics. I live in Missouri and have been to Toronto only , many years ago . I"d love to visit other parts of Canada. ! and you had me at Teal. I love your quilts! Living in calgary now, but spent my university years in edmonton. Love them both! I live in Alberta, in the beautiful city of Lethbridge. I have lived in Ont., Man., Sask., and now Alberta. I love your quilts. I have been to Montreal, Quebec, Lake Louise, Toronto because I used to live in Buffalo, NY, I have been to Niagara Falls and vicinity. I moved to Southern California years ago. See the snow in Buffalo now? love your quilts and the quilting. I live in Prince Edward Island now, and I have been to Banff, Calgary and Edmonton in AB. I have not been to the Territories yet though on my list! I live in Illinois, US, and have never been to Canada. I love your quilts! I live in Georgia and the only province in Canada that I have visited in Quebec. I had to travel to Montreal for a business conference several years ago and loved the city. Your quilts are beautiful. wow i love your modern quilts!! great colour sense and fantastic quilting! currently in toronto but also lived in winnipeg. have been to all provinces except newfoundland. it's on my list! Beautiful quilts - I really like the circle ones a lot! I live in Ireland but have visited Toronto and London in Ontario and Vancouver, BC. pick me! pick me!!! love that line!!!!! i was born and raised in edmonton (whoot! whoot!) but have been living on a farm in saskatchewan for the last 6 years. I live in Connecticut. I went to the 67 Worlds Fair in Montreal, with my family. Sadly, I haven't been able to travel to Canada since. Fun post and nice to see so many of your quilts again - loooove your quilting! I live in Washington State, and have HAVE been to Alberta! When I was a kid we went to the Calgary Stampede and Banff. We have also been to Vancouver and Victoria many times. I blog at http://aquilterstable.blogspot.com/ and would be thrilled to win this bundle! 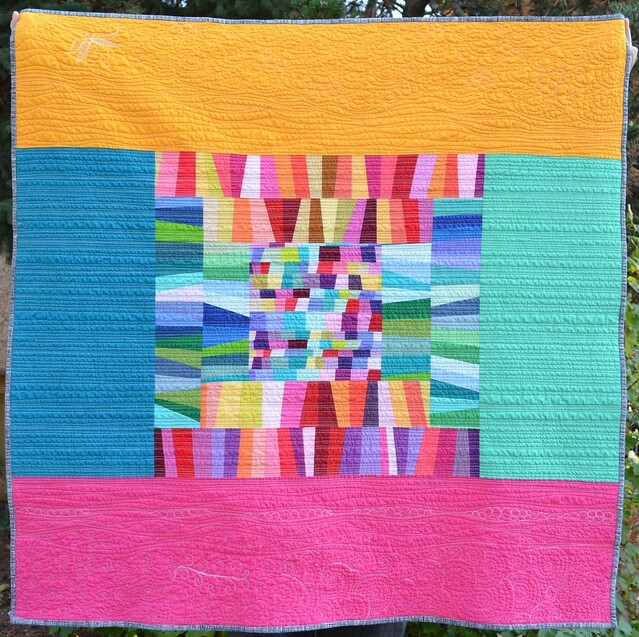 I'm so glad I found you through the Blogathon--I really like your use of colour and the quilting really shows off the work. I live in Quebec and since my daughter worked and lived in Alberta for a while, I have visited a few times! I grew up in Minnesota and currently live in Kansas. It wasn't until several years after moving to Kansas that we took a family trip to into Canada to Thunder Bay area. Amazing quilts! I live in Manitoba and have been fortunate to have been on both of our beautiful coasts. Have a lot of exploring in between to do yet! One of our daughters lives in Alberta, so visit regularly. We often take a day trip into the mountains! Thanks for the chance to win this gorgeous fabric! Amazing work! I'm a fellow Albertan and love our view of the rockies!! Your quilts are fabulous. Thanks for this opportunity to hopefully win the Doe FQ's. I'm in The Niagara region of Ontario and have been to your beautiful province many times. Love your work, you are a wonderful quilter. I live in New Brunswick, and have been all across our amazing country with two notable exceptions: Nunavut and the NWT. Someday.... Thanks for the terrific giveaway! I live in Illinois. I have been to Alberta, it is beautiful. Your quilts as always are simply stunning. Thanks for being part of the blog hop and thanks for the giveaway. I live in Saskatchewan so I've been to Alberta many times- gotta love Banff, Lake Louise and Calgary shopping! Thanks for the giveaway! I enjoy reading your blog! I lived in AB for four years, but am now in BC. We travel to AB at least once a year. THANKS for the chance at that bundle! I'm on Vancouver Island. I love that blue and grey quilt. The quilting is so effective! Very interesting meeting you. The fabric bundle is just too wonderful to contemplate. I am from Ottawa Canada and my best quilting buddy is in Calgary Alb. These fabrics are stunning. bclark26@rogers.com. I'm really enjoying "meeting" all these people on Blogathon Canada. I live in New Brunswick and yes, I have been to Alberta. We did the Edmonton, Calgary, Banff, Lake Louise and Jasper visit. Your blog is always such a lovely and inspiring place to visit, Leanne. Thanks so much for hosting along with Kelsey today! Hi I am from Nebraska. I have been to Vancouver a couple of times. Those fabrics are just beautiful. I live in Germany and have been to Alberta and British Columbia in 2008 - and loved it even though there was more snow in the Rockies in July than I expected. 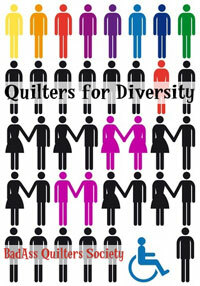 I blog at http://serendipita.org/ but don't write about sewing or quilting much. I don't have time to sew a lot, but love it. My (now deceased) grandma gave me her treadle machine a few years ago, and I've sewn all my quilts on it. I don't think I would know how to use an electric sewing machine! 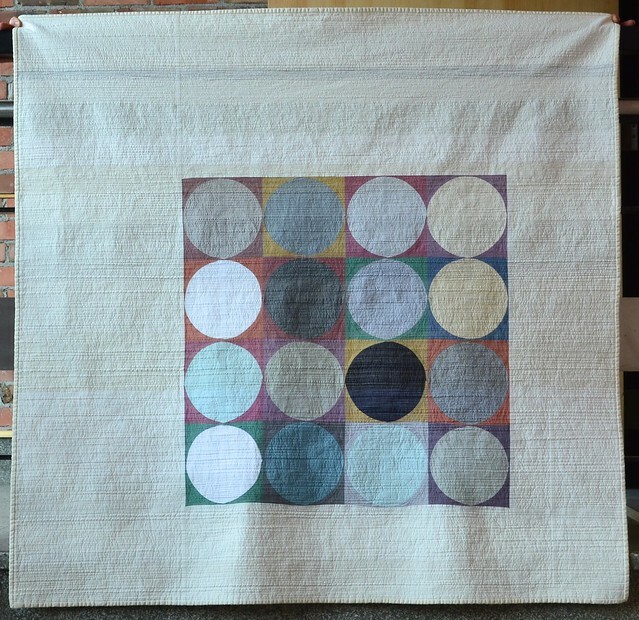 By the way, I love your quilts that feature circles in different colors and matchstick quilting. Thanks for the giveaway! i currently live in Quilt City USA - Paducah, KY! the only place in Canada I've been to so far is PEI because anne of Green Gables! thanks for sharing such great projects. Your quilting always amazes me. The close lines add so much texture. I'm from Victoria, BC, and we drive out to Alberta every year to see my husband's family in the Red Deer area. We have family in Edmonton, too and have been there. Can't miss the big mall! Nice to learn a little bit more about you! I have lived two places in Alberta - Strathmore and High Level. I now live in Oregon but I lived in Washington most of my life, near the Canadian border. I have spent quite a bit of time in Canada. BC and Alberta. Canada really is quite beautiful! Hello from Toronto. Yes, I have been to Alberta. My eldest daughter and I did a road trip with our main destination being the Stampede (2004.) It was a great trip and we even stayed at the University of Alberta for a night (since it was the summer) and did the West Edmonton Mall. I love your quilts and am amazed that you travel all the way to England for a retreat. and will be on the hop on Saturday. Doe! Great choice! Happy to visit for the Blogathon! Thanks for sharing your quilt history, I originally lived in Lloydminster, AB but we retired to Victoria, BC. Wow! Wow! you are so talented - love your free motion - I live in Cantley Quebec and I visited Victoria because my son had moved there last year. Unfortunately, I did not visit Calgary (yet). 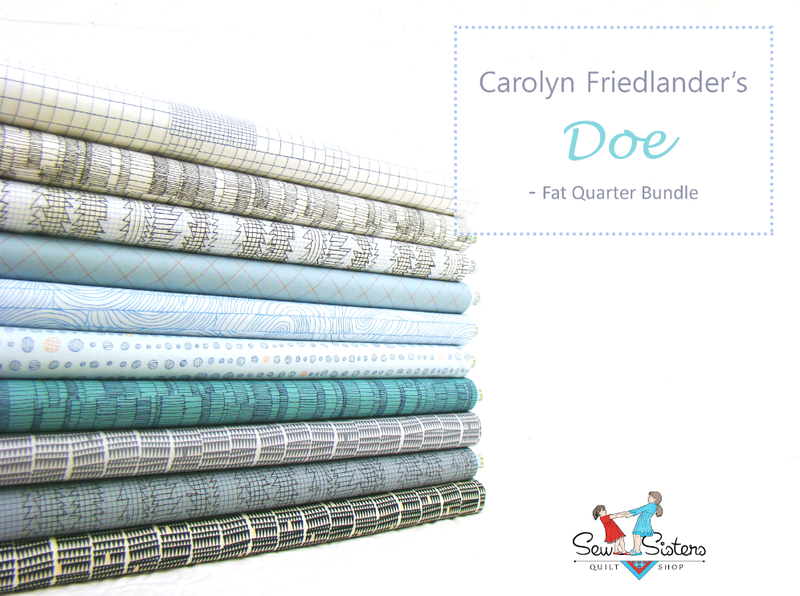 Thank you for the fantastic giveaway of fat quarters from Doe, by Carolyn Friedlander. Great to meet you Leanne and I love your work, beautiful colours. I live in France, would love to visit Canada and especially some of the lovely bloggers who I have met on line. I grew up in Vancouver,BC and currently live in Fraser Valley area. However, I have travelled around Alberta as I lived in Beaumont 2011-2013 and belonged to the Edmonton Guild. Also belonged to a group of quilters in Beaumont. I live not far by northern Alberta standards, in Peace River. I originally hale from BC but have been in AB for 12 years. I am a faithful reader of your blog, thanks for the chance to win! GREETINGS FROM MONTANA! We've only been to Ontario! Canada is so beautiful+would love to see more! Thanks for sharing! I'm in Airdrie, AB. and a member of the Airdrie Guild. Spent my high school years in St. Albert in the 70s (PKHS - Class that's Great is '78). Ha! Absolutely love this line, and love your quilts. I'm in Calgary, and I love our little corner of the country. Your quilts are beautiful, thanks for sharing! I live in Edmonton but still call Nova Scotia home. I have travelled all over this great country. I have been to all provinces (except Nfld.) and both Territories, ( I guess three now). I follow your blog and have for a long time. Am so enjoying this Blogathon. So many sites in visit. I live in Montreal, Quebec. I visited Calgary for work a few years ago and would love to go back one day. I do have family in the Edmonton area. Thank you for the wonderful giveaway. I live in Southwestern Ontario. I've never been to Alberta yet. I have lived in PEI and Quebec. 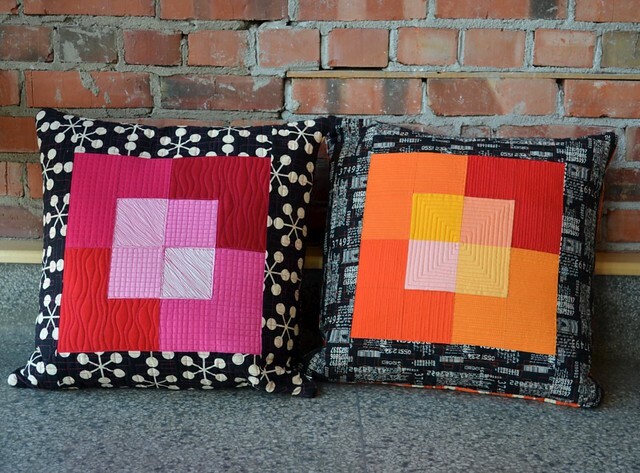 Hi - love your quilts, pillows! I've been to Canada 3 times - once from Upper NW New York to Michigan - 1 week in Victoria, BC and 1 week in Vancouver. Canada is indeed beautiful! Thanks for the lovely giveaway. I live in Indiana. I have never been anywhere in Canada, but I would love to someday. I live in a small summer village in Alberta, about 60 kms north west of Edmonton. Thanks! Love your quilts and quilting. Only one brief visit to Canada when we drove from Niagra Falls to Toronto to catch a flight to London. Please use lflemin at msn dot com as my email. I moved to California last year and miss Canada like crazy! I have lived in Manitoba, Ontario and Quebec at different point and have visited every other province except Newfoundland and PEI. I'm hoping to get up to some of the territories soon too! Thanks for the great giveaway! I am from Iowa. I have never been to Alberta, but I spent a short time in Ontario. I'm from the UK - I've never been to Canada but I'd love to!! I have been to Alberta! I lived in Banff for a year and worked in the theatre dept. at the Banff Centre. I've also lived in BC, ON, and NS, and I've travelled to every province except NFLD. I am from London, ON. I have been to a few of the provinces but never Alberta! Good morning from beautiful British Columbia! I have been to Alberta many many times. I started quilting 4 years ago after my husband got me a beginners quilting class for Christmas. I am addicted. Lol. I hope to purchase a long arm quilting system soon. I have had the pleasure of visiting Edmonton twice as I have a family member with the RCMP. Was able to visit the Banff area and was so impressed with the mountains and the turquoise water. I hail from Fredericton, NB. I have been quilting for about 8 years now and thoroughly enjoy sewing. Hello from New York, been to Montreal once. I would love to be the lucky person to win this beautiful bundle. I live in southern Alberta, near Medicine Hat. Thank You for giving us the chance to win. Hi Leanne! I am from a city close to Toronto, Ontario. I have had the opportunity to travel to Alberta...that was about 2 decades ago!! So I think I am due to travel out west again...don't you think? Love the scenery out there...absolutely breathtaking! Thanks for the chance and happy stitching! I'm visiting your blog from Lloydminster, Alberta/Saskatchewan, Canada's only border city. I love your work & your quilting is phenomenal! I live in Conestogo, Ontario, just outside of Waterloo. i visited my sister in Calgary a few years ago. She invited me to run the half marathon with her. lot of fun. I love in Georgia, but grew up in spokane Washington. My family and I went up to Edmonton and Calgary for vacation and to Kimberly for skiing :) lovely country! Hi! I live in sunny south Florida!! I have been to Montreal and loved it!!! I also love your blog and quilts!! Thanks for the chance to win the awesome Doe bundle!! I've been to Calgary and Edmonton for work a few times and did the drive through the Rockies to Vancouver once as well. But that was a long time ago. I love the colors of the Doe collection! I'm from Prince Albert SK but I travel to Edmonton and beyond quite often, and stop in the many quilt shops along the way. I don't know if you can contact me if I win - whether my email address shows up or not. I've never won anything before so I'm not sure. It's rdrunr@sasktel.net. Thanks for the chance, and thanks for sponsoring the blog. Would love to be a winner! I hail from NB but visit Alberta twice a year as my children live there. We drive across in the summer and fly at Christmas. Alberta like the rest of Canada is beautiful! I've spent a great deal of time in Canada, it's just a quick bridge or tunnel trip from Michigan into Ontario for me. I was very fortunate about ten years ago to see Christopher Plummer (Captain von Trapp from 'The Sound of Music') perform as King Lear during the Shakespeare in Stratford, Ontario. Other than Ontario I have visited Quebec and New Brunswick. Absolutely love this fat quarter package, now if I don't win I will have to order it. I live in Pennsylvania and have not had the opportunity to visit Canada. I've driven across Canada several times. I've lived in the Yukon and Northern BC. I've visited Calgary, Banff and camped in Dinosaur Provincial Park. I live in Ontario. Hi Leanne, it's me - your friend in the middle of England. I could happily sit here all day just scrolling up and down looking at all the lovely photos again and again. Honestly, done it three times already! Yes, that's a wonderful set of fabrics for the giveaway! Please count me in. I live in Saskatoon...just a stone throw away! I do come to Edmonton for a couple days every month too. Hello from sunny Orlando Florida. Love what I've seen on your blog so far, need to check out some of your older posts. As for where I've traveled in Canada - I used to live in Northwest Ohio, an easy jump up to Windsor. I've also spent time in Niagra on the Lake at the Shaw Festival. Scuse me...I'm drooling over your giveaway fabrics! Hi from chilly Toronto! I've spent some time in the gorgeous Ontario cottage country as well as other places in Ontario like Niagara-on-the-Lake and a bit of time in Quebec. Just seeing these quilts again makes me happy! Thanks for sharing your talent with us, Leanne. I've been drooling over Doe since I first spotted it. Thanks for the giveaway. Your quilting is beautiful. I've been to Alberta and have online pals from there AND we have also met in person. I'm in BC on the Wet Coast. I live in Toronto, ontario, and I don't blog. I like in Massachusetts, and I dream of visiting Canada some day, but I have never been there. However, on my father's side my heritage is Canadian, just back a few generations. I am from Waterloo. We were in Alberta many years ago over Canada Day near Banff. I went to the resort gift shop in the morning and bought myself a pair of mittens. Good thing I had been to the Edmonton mall a few days earlier and bought some new pants. I did have to put socks on with my sandles. Yes, I've visited Kingston, Ontario on a not too cold November day and spent a good part of it walking the Lake. Your quilts are stunning...I love bright and warm colors to I'm in awe! Thank you so much for sharing. All my best from Hampton, Virginia USA. Thank you for the giveaway. Your quilts are amazing. Love the colors. I am from N.E. Georgia, but I have never visited Canada.I would really love to do some traveling and visit there some day. Great fabric have been to Toronto, Ontario, Victoria and Vancouver. I live in Ohio. We got to go to Toronto,bout 14 years ago now, to see Phantom of the Opera!! AWESOME!!! Nice fabric, I live in Sherwood Park, Alberta and have been to BC, Sask, Manitoba and Ontario. Thanks for taking part in this great cross Canada even. I live in Toronto and Sew Sisters is my store of choice. I have travelled all across Canada except for Newfoundland . Your quilts are terrific. I live in PEI now, but I have lived in NB, MB, BC, NS, and AB (Calgary, High River, Hinton, Grand Cache). I'm pretty sure we are finished with the cross-country living, we plan to stay in PEI! Hi! I am from Sydney, Australia and I have never been to Canada but I hope to one day, it looks beautiful! Your quilts are spectacular!!! I'm visiting from Parma, OH...just south of Cleveland...in the USA. I've been to Canada a few times when I was young...I remember Niagara Falls & Ontario, where my Mom had a childhood friend. Howdy, Neighbor! I'm from Idaho, but more toward the southern end of the state. We stayed in Calgary one year on our way to Banff National Park - couldn't get over that it was still light outside at midnight - try telling kids they need to go to sleep then, lol. Love your work! Fabulous quilts and love your fabric combo.I haven´t been in your country but I`d love ,perhaphs one day will be possible.I`m from Spain.Thanks for the fun! 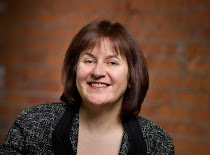 Great to find your blog! I am currently living in New Brunswick although I have lived in all the Atlantic provinces, growing up on PEI and having my kids in Goose Bay, Labrador (technically a part of Newfoundland though the Labradorians feel they should be a province in their own right!). I lived in Toronto and have travelled extensively through Ontario and Quebec. My hubby and I have a plan to fly to BC, buy a car and take our time camping and hiking across Canada. I live on my boat, and currently we are in a boatyard in Deltaville, VA on Chesapeake Bay. I've heard wonderful things about boating in Canada! So far, I've only visiting Vancouver, BC and it was lovely. My niece and nephew live there now, and their photos of the mountains are drool-worthy. Your quilts are gorgeous! I admire your quilting skills! I live in Pennsylvania and I was to Quebec in the early 70's. Beautiful country! I'm in MN, and even though w are very lose neighbors, I've only been to Canada once on a camping trip. I live in North Carolina at present. Many years ago I visited Banff. It is so beautiful. Pretty fabrics! Loved virtually visiting the quilters featured here! HI, I am from Lindsay, ON and have been to Alberta several times most recently last summer for the Stampede and a visit with friends at Smoky Lake (know where that is) Love your blog and your give away. I'm from Ontario and have also visited Quebec. I live in Surrey, BC, just outside of Vancouver. I've been as far east as Saskatchewan. Travelling across Canada to Newfoundland is on my bucket list. I live in San Diego, CA right now. I have never been to Canada but I really want to go to Bamff. I'm from Dartmouth, Nova Scotia. I have been to Edmonton once for a Girl Guide event. Love your pillows. Thanks for the giveaway. What lovely quilts you make-and I especially like your pillows. My husband and I lived in Lethbridge for 4 years, and had our first daughter there. We now live in NS, moved back almost 13 years ago, but still visit AB now and then. Hello from New Westminster BC. I've been to both Edmonton and Calgary, but that was many years ago. I live in Virginia and I've been to Montreal, Quebec, Vancouver, and Campbello Island. Your quilts and quilting are lovely. I am visiting from Dubuque, Iowa! Dubuque is Iowa's oldest city and is located right on the Mississippi River. I have visited Canada twice. the first time was to Ontario and we also went to Niagara Falls. the second time we were on an Alaskan cruise and stopped in British Columbia. Beautiful country! I live in rural upstate NY, near Oneonta (if you're looking at the map). It's a pretty place to live, but not much "going on" and I like it that way. I can get all the action I crave by taking a short drive to a few major big cities, should I have the hankering to get it. :) Thanks for opening the giveaway to everyone. I live in Houston, Texas. I've been to Calgary twice- once in the winter for business, and once in the summer to visit a friend. Just lovely! Hope to visit again someday! Wow, these quilts are incredible! I'm from Australia but I have lived in VA, USA for 9 years now. I have been to Niagara Falls (Canadian side of course! ), Toronto, and Montreal. I am in IL and I have gone through Can to get to NY, I have no idea why my mom took that route. I didn't see anything. :( My husband and I hope to move to Can someday. We love the cold and the snow. Thanks for hosting the Alberta stop on the Blogathon and for linking to my site! :) (http://ecoslo.tumblr.com) I live here in Edmonton! LOVE the Doe collection, will need to get some soon! I am from New Zealand and have never been to Canada although it is on my must visit list. I am from Indiana. I haven't had the chance to visit anywhere in Canada yet. I would love to visit, but 3 year old twins make it a little difficult to travel. Your quilts are gorgeous! Love the modern look. I lived in Edmonton for several years, looking forward to visiting the Alberta blogs.